Big news! ANOTHER house Catawba Valley Habitat’s Northstone community has received a Housing Innovation Award! Each year, the U.S. Department of Energy recognizes organizations that are on the path to creating Zero Energy Ready Homes. This effort not only helps preserve environmental resources, it also reduces energy costs for homeowners. This year, the Hawkins plan received a Department of Energy 2017 Housing Innovation Award in the “Affordable Homes” category! The “Hawkins” is a one-story design of about 1,230 SF, including three-bedrooms, two-bathrooms and an open living and dining area with a vaulted ceiling. Once again Catawba Valley Habitat invested in high efficiency appliances, and advanced technology for energy and water savings. The use of engineered wood siding and 30-year architectural shingles help increase the durability and longevity of the exterior. Heating and cooling costs are reduced with the implementation of R-15 insulation in the walls as well as rigid foam insulation on the exterior. The Hawkins scored a Home Energy Rating System (HERS) score of 46, and has an average monthly energy bill of $65! In addition to energy efficiency, Catawba Valley Habitat is working to incorporate principles of Universal Design in all of their homes. This Hawkins plan includes: a minimum 5ft turning spaces in the kitchen and master bath, a 42″ wide hallway, blocking in both bathrooms for future installation of grab bars (if needed), and 36″ doors throughout the home. 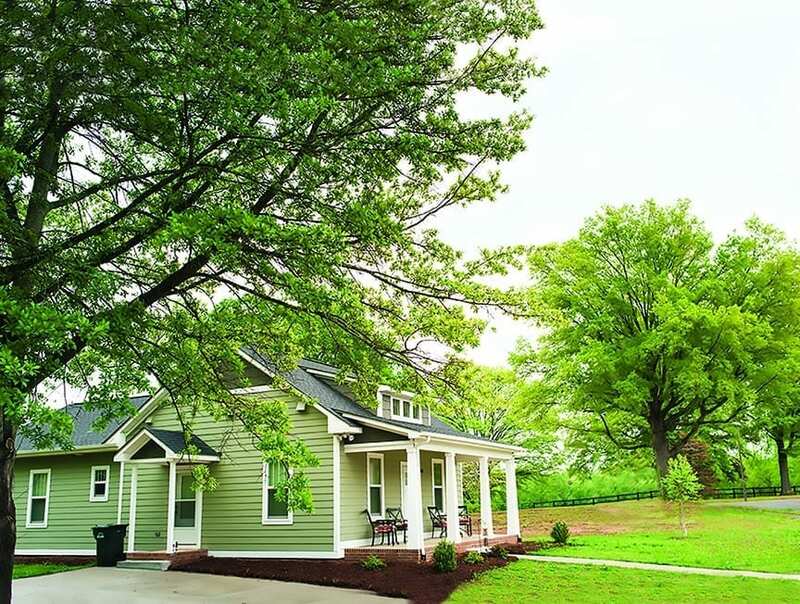 This is just one house in a 22-lot mixed-income community that Catawba Valley Habitat is building in Hickory, North Carolina. We look forward to continuing our partnership with them and creating more homes as energy-efficient as this Haywood and the previously awarded Julia! For more information, visit DOE Tour of Zero: Northstone Bungalow. For other awarded projects, visit the Housing Innovation Awards homepage.